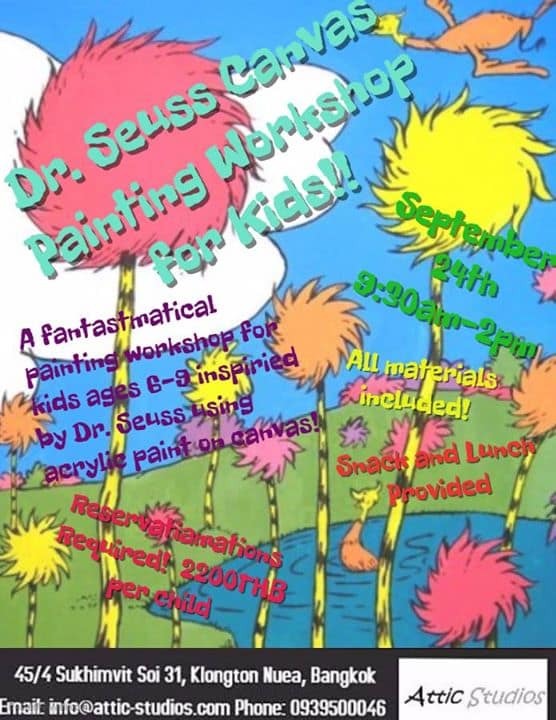 A fantastic event here at Attic Studios for you young artists to create a stunning piece of work inspired by Dr. Seuss using acrylic paint on canvas! Students will start the lesson learning about Dr. Seuss and exploring his unique creative style by looking at books and video. After discussing Dr. Seuss, students will learn about how to build up a picture on a canvas starting with the largest shapes and moving to the smallest shapes. It will be a fantastic day of color mixing, painting techniques, music, food and IMAGINATION!!! Snacks provided throughout the workshop as well as picnic style lunch at the end. 2200THB per child. Reservations required. Please contact Attic Studios for reservations and inquiries!